North Tahoe opens the season at home on Saturday, Aug. 25 against California School for the Deaf. Kickoff is scheduled for 1 p.m.
Three years ago a core group of freshman first took the field for the North Tahoe Lakers football team. 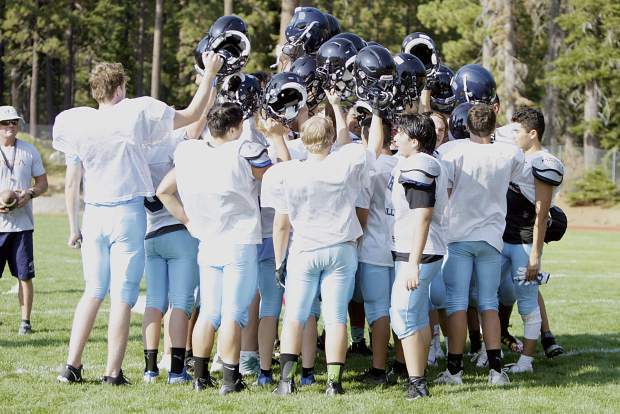 Now entering their senior year, those handful of players will look to bring the North Tahoe football program its first winning season since returning to Class 2A. “There’s a good core of seniors this year that have played for a while together, some of them back to Pop Warner days,” said Head Coach Scott Everist. The Lakers relied largely on juniors and underclassmen on a team that went 4-5 last year and had just two seniors with limited experience in the sport. This season, North Tahoe sports nine seniors on its roster, which, according to MaxPreps.com, is the most on the team since at least 2011. Still, with a roster of 30 players — many of which are underclassmen — staying healthy throughout the season will be one of the most important factors for the Lakers. Entering his fourth year as a starter, senior quarterback Thomas Mercogliano said the team is going to look to put the ball in the air even more this year in an attempt to open things up and take advantage of a deep group of receivers. Last year, Mercogliano was prolific as both a passer and a runner. He led the Lakers with 1,048 rushing yards, six touchdowns and an 8.7-yard per carry average. Mercogliano connected on 56 percent of his passes for 1,220 yards, nine touchdowns and two interceptions. The squad will return its leading receivers from a year ago in senior captain Dalton Lamberth and junior Stephen Lopez. The Lakers will also rely on seniors Eli Snyder and Kobe Robbins as well as sophomore tight end Ben Trujillo, who Everist said has stood out due to his good hands and tough running during the team’s first practices. Another player who has stood out in the early stages of the year has been junior receiver Cooper Kohnen. On the ground, senior halfback Tony Frankenberg and senior fullback Raul Estrada will return as the Lakers’ starting backfield, adding a physical element to the team’s offense. With experience all over the field for the first time in years, players said this year’s Lakers defense is all about being physical and getting 11 guys to the ball. Senior Captain Ethan Everist anchors the group, and at 6 feet, 6 inches, and nearly 300 pounds, has the ability to play multiple positions up front for the team. The team got its first look at live action last weekend in Incline Village, and after taking on a trio of opponents at the scrimmage, players said defensive play was one of the highlights of the day. The battle up front will be crucial in the team’s opener this Saturday as the Lakers host California School for the Deaf and its bruising running back, junior Calel Olicia-Aramboles. The 5-foot, 11-inch, 232-pound back rumbled for more than 1,500 yards last year and averaged nearly 11 yards per carry for a team that went 5-4. The Eagles opened the 2018 season last weekend with a 54-20 win over Sacramento-based school, Encina Prep. Kickoff for the game is scheduled for 1 p.m. Saturday, Aug. 25, at North Tahoe High School. From there, North Tahoe will travel to open league play against Incline, rekindling their rivalry with the Highlanders. The team then returns home for a Saturday game in week three against Silver Stage.